We've finally gotten to peek a glimpse of what this year's edition of the Michigan football team is supposed to be about. Last Saturday night at Illinois was a true test for this squad. It was night, it was loud, and Illinois is still a good football team. Take away a botched punt catch and a few key penalties, and I'm sitting here questioning everything that Michigan did wrong. But the breaks went our way. Michigan's defense stiffened when it had to. Chad Henne showed more character than he has maybe in his whole career. After going out in the first half, and then sitting for 3 drives in the 3rd quarter, there was no question Chad was missed. 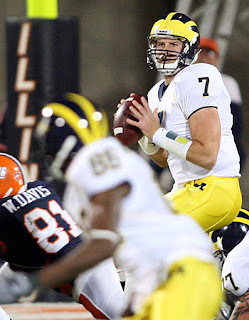 Don't get me wrong, Ryan Mallett is going to be a stud at Michigan, but he's not quite ready for prime time yet. Mike Hart is the soul of this team. There was probably no question he was going to sit out, but there was probably no question that he needed to be on the sidelines anyway. 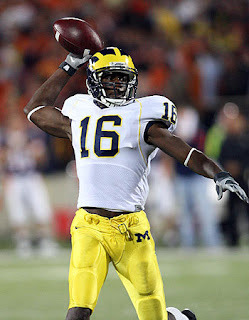 Just his presence, his smile, and his demeanor are crucial to Michigan's success. But what we learned Saturday night was Chad Henne is clearly the principal leader of this offense. He touches the ball every down. He's the commander. When he backs away from under center before the snap and raises his arms to signal the receivers and backs, (which I know drives most Henne-haters insane) its not simply an audible. He calls 2 plays in the huddle. He then waits to get to the line to read the defense. Stunts, blitzes, coverages...where he sees the safeties leaning...all of those are calculated before he then backs away from center to call the play. I would like to assume that most college QB's don't call the majority of the plays at the line...or at all. I've seen him doing this for the past 3 years. Even Mallett is starting to do it. Obviously Henne's playbook is much bigger than Mallett's, and I think that was evident on Saturday night. How great was that call? Who are you and what have you done with Mike DeBord? Don't get me wrong though, Mike Hart is amazing...and if the nimrods who vote for the Heisman trophy knew forwards from backwards, they'd see that. I seriously doubt either Chad nor Mike will play, even dress for the big Minnesota matchup this weekend. You could say this is a potential upset given that Michigan's schedule is going to get much tougher after Saturday. The November run. At MSU, at Wisconsin, and OSU at home. Not an easy stretch. So the argument could be made that Michigan is overlooking the Gophers. But given that Lloyd is hell-bent on tradition, the Little Brown Jug is going to play a factor. Lloyd is showing tape everyday of the Minnesota players sprinting to the Michigan sideline to reclaim the Jug when they upset Michigan in 2005. Ask any player on that '05 team what was the worst moment of that season, and I bet most will tell you seeing Minnesota celebrate with the Jug in the Big House. So I'm guessing that ain't happening again.